GR: The growing human population is the source of most of the environmental destruction that is threatening the biological diversity and stability of the Earth. Here’s some information from Joe Bish of the Population Media Center (PMC) that will help you stay updated on critical issues (Fertility projections). Bish is reporting on the latest United Nations nonsense about sustainable development. 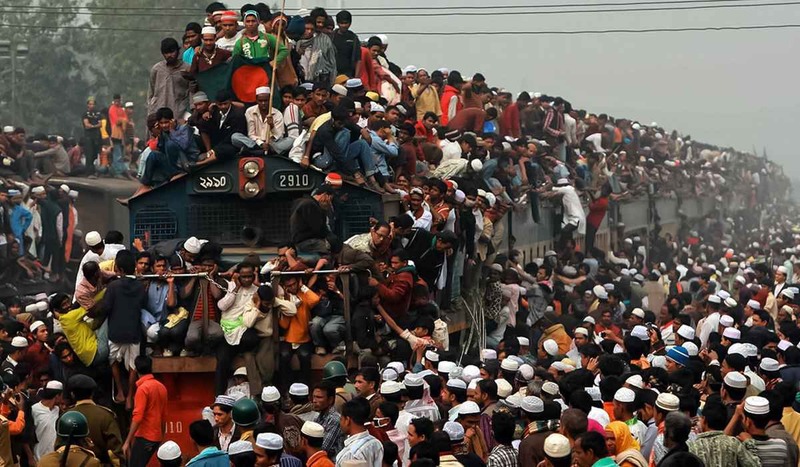 Travel by train in India (anonymous). “Welcome to Population Media Center’s Weekly News. Click here to review an on-line newspaper filled with population and sustainability related stories.They provide a good summary of international developments and population-related news-flow during the past week. “It is debatable as to what was the biggest news in the field this week: the 50th session of the Commission on Population and Development was convened in New York City — and the current U.S. administration cut off American funding for UNFPA. Normally, I would say the latter was a much more meaningful news-item, after all, the cut-off of funds will lead to the suffering and death of multitudes of women and children. On the other hand, you will likely join me in disbelief and consternation to find the official news release from the UN (see below) has a headline that states “population… decline” is a key focus of the 50th session. “Bear in mind that during the 5-day work week of proceedings at the UN, global population will have increased by roughly 1.1 million people. Also, you don’t need reminding that since the Commission was established in 1947, world population has risen by well over 5 billion people. Yet… “population… decline” is the headline? 3 April 2017 – The United Nations advisory body on issues related to population and development today kicked off its annual session, with a focus on changing population age structures and sustainable development. “Population ageing and population decline have now become key issues for a growing number of Member States,” Under-Secretary-General for Economic and Social Affairs Wu Hongbo told the opening segment of the Commission on Population and Development’s fiftieth annual session, which will run at UN Headquarters through 7 April. He also noted that with global fertility at, or even below, fertility [sic] level, international migration “is becoming the main driver of population change for a number of countries.” –United Nations (Continue: PMC’s Weekly News: 50th Session of Commission on Population & Development). This entry was posted in development, Governments-Against-Consumers, Population and tagged overpopulation, sustainable-development, United Nations by GarryRogers. Bookmark the permalink.